Federations are groups of religious communities (in our case, monasteries) who follow the same Rule and Constitutions, and, with the permission of the Holy See and under the supervision of its appointed delegate, organize to meet together at appointed times to discuss matters of relevance to the members. The Federation does not have legal authority over the constituents except in matters directly referring to the Federation Statutes, nor does it in any way interfere with the autonomy of the individual monasteries. The purpose of the Federation is encouragement and support for its members in the enactment of their particular life style. Meetings of the Federation would be attended by the superior and a delegate from each community. The meetings would be planned and executed under the supervision of a council consisting of a President, Vice-President, and three other sisters who are elected from the member communities. Possible issues to be discussed could be the interpretation of the Rule and Constitutions, the adaptation of the Order to the signs of the times, the solution of problems particular to the life style, etc. 3) the teaching of particular skills needed to maintain the monastery financially, etc. Other possible projects that might be helpful to the members are special formation workshops or meetings, and, if considered advisable, a central formation house for all the postulants and novices in the Federation could be an option. The Federation also provides a process by which a member of one Monastery, who has a sufficiently good reason, may transfer to another Monastery of the Federation. In 1950 His Holiness, Pope Pius XII, wrote a memorable Apostolic Constitution entitled, “Sponsa Christi,” which dealt with many facets of the contemplative religious life style. Among other things, His Holiness recommended the federation of monasteries as a spiritual and moral support to the members and a help in promoting regular observance of the contemplative life. The Federation he proposed would in no way supersede the autonomy of the individual monasteries. 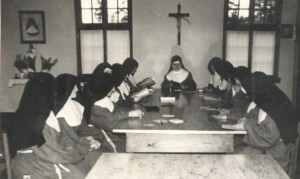 The Sisters of St. Clare (O.S.C.) in the United States did not act immediately upon the Pope’s suggestion. However, on November 29, l958, representatives of the Sisters of the O.S.C. observance met at the Monastery in Evansville, Indiana, to discuss the topic of a possible federation of their monasteries. Presiding at the meeting were three Franciscan priests: the Very Reverend Pius Barth, OFM, Minister Provincial, assisted by Fr. Marcian Mathis, OFM, JCD, and Fr. David Eckelcamp, OFM. No definitive decision regarding a federation was reached at this meeting. It would seem that fear of losing the autonomy of the individual monasteries was a prime obstacle to embracing this action. The sister’s agenda for the meeting had 24 items to discuss in the two working days set up. After the 4th working session, a verbal non-deliberative vote was taken. The results were almost unanimously “No” to the formation of a federation. The only monastery to vote in favor of federation was the newly established monastery of Minneapolis, Minnesota. Further time was allowed for discussions around the fears, as well as the request by the church for these federations. It was after these discussions that a deliberative vote was taken, and the results were now 19 in favor of, with 3 votes against. The proposal to send the Statues for the Federation was unanimously approved. It was at this meeting that the decision was made that due to the large distances to be covered, there would be two federations formed instead of one. The Mother Bentivoglio Federation would be formed by the monasteries in the Midwest, West, and British Columbia, Canada. Holy Name Federation would consist of the monasteries along the East coast inland to Philadelphia. At the close of the two days of official sessions, the Abbesses and Delegates were encouraged by the friars facilitating this meeting to stay on at the Evansville meeting for several more days to profit from the exchange of ideas among themselves. This mutual sharing over common problems was tangible evidence on only one of the many benefits to be expected from a Federation of Monasteries. 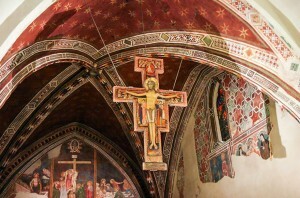 A vote was taken at each of the monasteries and submitted to the Holy See in Rome. On June 13, 1963 the Federation Statutes were approved for a period of 7 years. It took another year before the English translation was available from the Latin. During the year of waiting, Fr. Pius Barth OFM, who had been appointed to assist the sisters, travelled tirelessly from monastery to monastery, talking with the sisters, allaying fears, and explaining the new Statutes.